Semi-desert. Open shrub and grasslands. Spring. This tiny Gilia lacks a basal rosette of leaves and usually branches near the base. Flowers are pale blue/pink and the flower stems are covered with minute glandular hairs -- visible in the photo as tiny tack-like projections along the flower stem. This Gilia and Gilia ophthalmoides are abundant, but to find them requires a very slow walking pace with eyes on the ground. Marcus Jones collected this species in Idaho in 1899 and named it, according to Intermountain Flora, Gilia sinister in 1902. 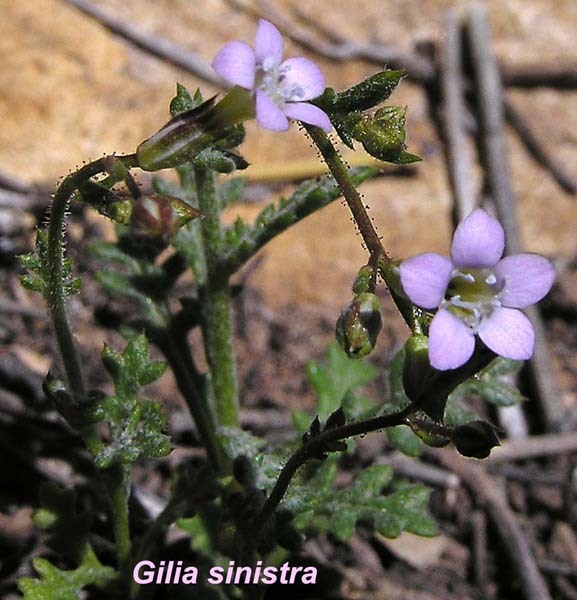 Weber and the Synthesis of the North American Flora indicate that Jones named it Gilia sinistra. A number of botanical authorities now consider this plant to be in the genus Navarretia, a name given by Ruiz and Pavon for a plant they found in Chile and Argentina in the late 1700s. They named the genus for Spanish physician and botanist, Dr. Francisco Navarrete. The relevance of the Latin word "sinistra", which means "on the left hand" or "awkward" is unknown.